Between 2002 and about 2005, National Geographic series published a well-intentioned, but decidedly mixed group of travel memoirs called National Geographic Directions. Excellent contemporary writers were commissioned to write about parts of the world they know intimately (perhaps too intimately to write well about, at times). Writers included David Mamet (on his corner of Vermont), Jan Morris (on her house in Wales), Francine Prose (on Sicily), W.S. Merwin (on southwestern France), Robert Hughes (on Barcelona), and Oliver Sacks (on Oaxaca), among others. As far as I can tell, the series stopped after about twenty titles. Along with Jan Morris’ great contribution, my favorite title in the series is Louise Erdrich’s Books and Islands in Ojibwe Country (Washington: National Geographic, 2003). Erdrich, who owns a terrific small bookstore in Minneapolis called Birchbark Books, writes of a driving and canoeing trip into the lake country of northern Minnesota and northwestern Ontario. Naturally, it’s a multi-layered voyage of discovery – involving a personal relationship, a new daughter, her Ojibwe roots, her love for books, and surprisingly much more – all in about 142 pages. Book collectors will be particularly interested in Erdrich’s description of the house of Ernest Carl Oberholtzer (1884-1977), a preservationist (co-founder of the Wilderness Society and a battler for the Boundary Waters), self-taught expert on the Ojibwe, and an exceptional, if eccentric, book collector. Oberholtzer spent most of his adult life on tiny Mallard Island in Rainy Lake, north of International Falls, MN. 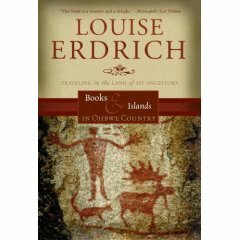 The last thing one expects to find in a hand-built house on an obscure island in a remote and unpopulated part of Ontario is a book collection of more than 11,000 volumes, and Erdrich has fun exploring both the island and library during her stay there (the property is now run by a foundation). For more on Oberholtzer and Mallard Island click here. While reading Books and Islands in Ojibwe Country it was a curious and pleasant surprise to find that one of the books Erdrich packed for her trip was Sebald’s Austerlitz, which she quotes and discusses admiringly on several occasions. (For her travel reading list see page 10 and for her commentary on Sebald see pages 95-97 and 133-135.) Erdrich has her own shock of recognition as she reaches the end of Austerlitz. 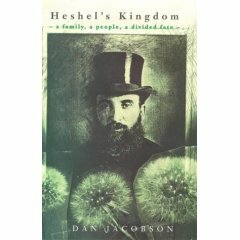 She discloses that her advisor when she studied at the University of London in the mid-1970s was Dan Jacobson, whose own memoir of the Holocaust – Heshel’s Kingdom (London: Hamish Hamilton, 1998) – is discussed at length in the closing pages of Austerlitz. When I visited Birchbark Books last summer, signed copies of this and other Erdrich titles were available.